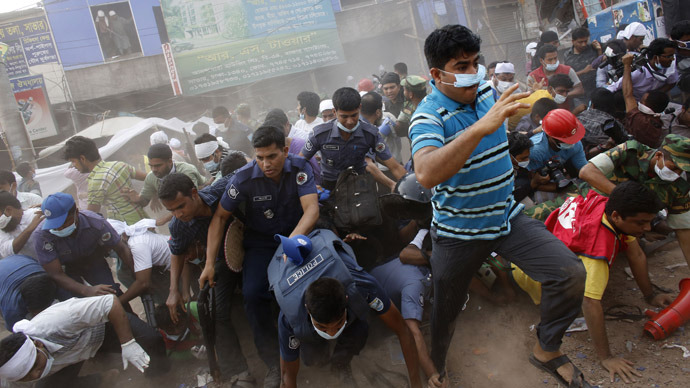 Bangladeshi police fired tear gas and rubber bullets to disperse a crowd of enraged workers protesting the deaths over 300 of their coworkers in a Wednesday garment factory collapse. At least 25 people have been injured in the clashes. The demonstrators – some armed with bamboo sticks – blockaded roads, smashed vehicles, burned tires and attacked factories at Gazipur, just outside the Bangladeshi capital Dhaka. "The situation is very volatile. Hundreds of thousands of workers have joined the protests. 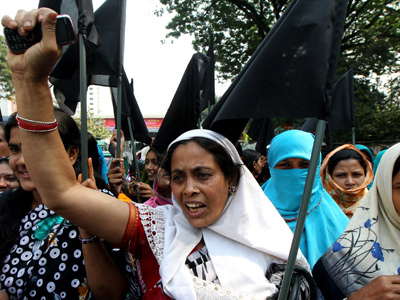 We fired rubber bullets and tear gas to disperse them," M. Asaduzzaman, an officer in the police control room, told AFP. 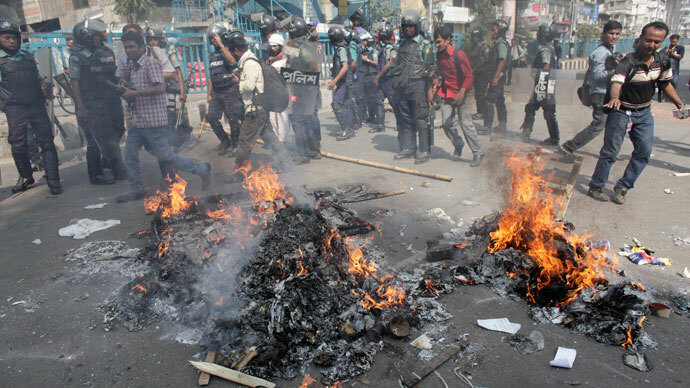 The rioting also spread to several districts in the capital, local media reported. The protesters have demanded the arrest and execution of those responsible for the disaster, and blamed the building’s owners for the deaths. The collapsed eight-story building at Savar, a town on the outskirts of Dhaka, housed five factories. Rescuers have recovered nearly 300 bodies form the rubble, and found 62 people buried alive in the ruins; the death toll may rise further. The prime minister’s adviser has warned that the death toll could exceed 350. There are fears that hundreds of people remain trapped in the wreckage of the building, which officials claim was built illegally and without proper building permits. "Some people are still alive under the rubble and we are hoping to rescue them," Reuters cited deputy fire services director Mizanur Rahman. The building reportedly developed cracks on Tuesday evening, but the owners ordered fleeing workers to return to their production lines, survivors said. 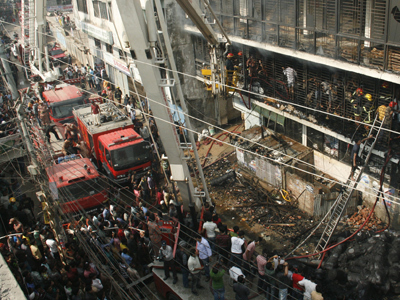 The incident was the worst to befall Bangladesh since a fire in November 2012 that killed over 100 workers. Many of the country's 4,500 factories have already been closed due to protests and fears of damage. Manufacturers have declared Saturday to be a holiday, while trade unions called for a strike on Sunday to demand better working conditions, AP reported. Special prayers for the dead, injured and missing were offered at mosques, temples and pagodas across Bangladesh on Friday.